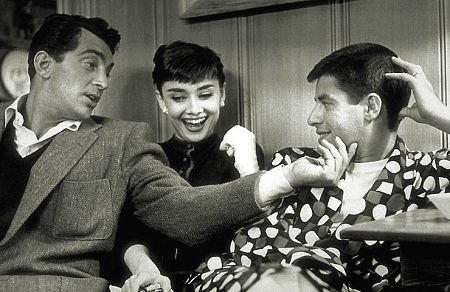 Audrey with Jerry Lewis and Dean Martin. . Wallpaper and background images in the audrey hepburn club tagged: audrey hepburn jerry lewis dean martin photos. This audrey hepburn photo contains setelan jas untuk bekerja and setelan bisnis. There might also be tanda, poster, teks, and papan tulis.